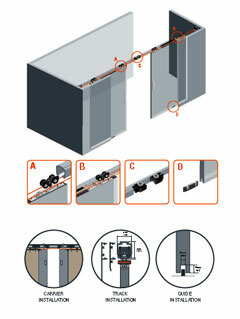 Top sliding system for wood or aluminum doors installed inlay the opening and traveling in line. Doors will open, synchronized, in the opposite direction with only one movement. Door width up to 1550mm (5.0 ft). One box with all you need to install 2 panels, just order the track and you are ready to go.